The more carefree among us might be happy to stuff our daily essentials into an old multi-purpose backpack or laptop bag, or even just refine down to what fits in our pockets and hope for the best. But with many clothes sadly pockets-less, and a whole host of very important things to keep about our person, a bag is, for the more nervous among us, a necessary ally, whether we’re heading to the corner shop or even another country. Even if you’ve got your luggage wardrobe nailed — a work-smart handbag here, a satchel there, a full-on suitcase for jaunts around the world — it can be tricky to decide what to do for in-between days, overnight stays, and shorter trips; a weekend away, for instant. That’s where our list of the best weekend bags comes in. A weekend bag or holdall is a godsend for those trips where you don’t want to take a full suitcase, but a large handbag just won’t cut it. And when it comes to bumping up the storage, the style needn’t suffer, as our list ably proves. With luxury offerings from the likes of Ted Baker and Longchamp to see you through formal and work events, professional-looking bags designed with tech in mind for working on the hoof, casual women’s holdalls for rough and ready weekends or impromptu family visits, and elegant compact pull-alongs, there’s something for all types. There’s a surprising number of factors that go into making the perfect holdall, but we think Bric’s have come pretty close with the Clipper, and the fact that it ticks all the boxes we can throw at it takes it straight to our top spot. It strikes a balance between elegance and practicality, with a considerable 50L capacity allowing freedom for short-haul packing, and sumptuous but stain resistant microsuede to keep the whole thing looking refined and nix any chance of bulkiness. And, in timeless navy with cognac brown contrast leather accents, it aces that classic holdall look. An all-round winner. This quilted holdall from Red Herring has the streetwear look absolutely nailed, making it perfect for casual weekend getaways, packing a large than normal gym kit, or throwing a few bits into to head to a friend’s house. Its soft, malleable construction makes it easier to pack and store than a structured bag, and the detachable shoulder strap means you can wear it across the body for travel, or carry like a handbag. Luxury leather goods company Longchamp have perfected weekend style in the form of their classic Boxford travel bag. Finely crafted from contrasting leather and canvas, with an instantly recognisable look and a generous amount of storage for a long weekend, it’s a truly aspirational piece of luggage. Hold it like a handbag, or over your shoulder with the detachable strap — either way you’ll look utterly dashing. There are plenty of accessories out there for panicky travellers, but not many of them look as good as this. The Citysafe Anti-Theft Tote from Pacsafe gives you plenty of room for your essentials and organises them neatly in its zippered compartments, but best of all, it keeps them away from opportunistic thieves. Lockable zips, Turn ‘n’ Lock security hooks for the detachable straps, slashguard material that defeats cut-and-runners, and RFIDsafe blocking pockets all conspire to keep your valuables out of the wrong hands. If you’re worried about security on your next trip, consider taking this with you. If you dig the good looks of Longchamp’s Boxford bag, but have a tight budget, this luxe-looking Haular bag is a great, pocket-friendly alternative with a large capacity. It’s sturdily built, with structural leather-look accents and premium quality duck canvas, which comes in a range of classic neutrals plus a few standout shades. It’s also the perfect size to take as a carry-on, as it complies with even the stingiest airline restrictions while still letting you pack a decent amount. 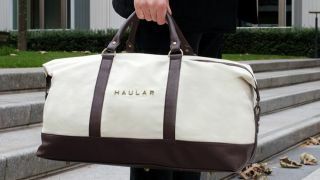 An elegantly understated unisex holdall at a reasonable price. This little bag has a lot of personality, with its smart retro stylings and contemporary colour scheme, perfect for taking on a romantic break, hen do, or weekend with the girls. With its smart compact size and ability to turn from a handled tote into a pull-along suitcase at a moment’s handle (just pull the tiny telescopic handle), it makes a great cabin bag for your absolute essentials. Durable, good-looking, and under £15 — what are you waiting for? Go explore! If you’ve been on the lookout for a classic holdall under £100 (way, way under), then this is your lucky day. This Go Explore offering isn’t real leather, of course, but it’s splash-proof and durable, and it looks darn good all the same, making it great for frequent travel and hauling on and off public transport without worry. The protective studs on the bottom are a nice touch to keep the bottom from wearing through. For a thicker, more considerable-feeling bag, you might want to spend a little more and go for the Haular option — but come on, it’s £14! For business trips and flitting between offices, this multifunctional laptop bag has our vote. It’s slimline and stylish, lightweight and durable, with a water-resistant Nylon outer that’ll keep moisture away from your all-important device, and a laptop compartment with a thick, shock-proof foam padding to protect it from bumps. It can be carried as a tote with its sturdy PU handles, or even converted to sit comfortably over the handles of a wheelie bag. If you love the idea of a laptop compartment, but would appreciate some brighter colours or a little more security, go for the Citysafe tote. Weekend bags can sometimes draw the short straw when it comes to looks, at least when compared to their everyday cousin the handbag. Not so with this Orla Kiely number. Featuring the designer’s iconic Multi Stem design, it’s a quirkier alternative to the standard holdall which, while stylish, can sometimes look a little samey. Its PU construction has the look and feel of leather, but doesn’t have the high-maintenance needs, meaning no panics when stowing it under and aeroplane seat or chucking it on the overhead on the train. Colourful, characterful, and sure to put a smile on your face, this is the one for vintage vixens and lovers of all things sixties.